The golden age of pirates might be a few years in the past (okay, so maybe it's a few hundred years in the past), but that doesn't mean you and your kid have to give up on the dream! Where's your sense of adventure? You two could be out sailing across the high seas, digging up treasures chests on uncharted desert islands. You two could be out there with cutlass in hand battling it out with a giant kraken. You two could be stealing Black Beard's secret treasure that just so happens to buried in your backyard. Heck, you could even be out there pillaging all the cookies in kitchen cupboards. Of course, the first step to your own pirate adventure with your kid is imagination. Your second step? Well, that comes down to having a cool outfit to wear, which is where we come in! Check out this Child Deluxe Pirate Costume! 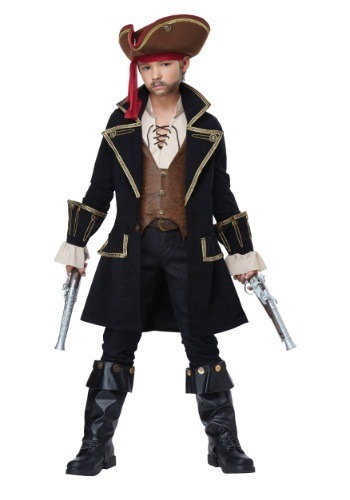 It comes with all the fixings your kid could possibly need to get the look of a rough and rowdy buccaneer. With faux leather accents, gold embellishments around the edges of the coat and some high-class looking cuffs, your kid will look like a top notch pirate in no time. Just be careful! He'll be looking like such a daring scoundrel that he may just demand to be the captain of the ship.